The boys' birthday party was a success! I think we all had a great time, but we missed the family and friends who could not make it. Having a party the weekend before Christmas in the worst weather we have had in years really cuts down the guest list, let me tell you! We appreciated those who could make the trek, and understand those who could not. The boys had a great time. All day I kept telling them it was their birthday, and I don't think they got it. Sure, they would say 'birthday' and we tried to get them to hold up two fingers to show how old they were, but they thought it was some new game. When we got to presents, though, it was a whole new world. They figured out those presents pretty quick, and really got into ripping off the paper. the difference between this year and last was they actually were interested in what was under the paper, and not just playing with the boxes and ribbons. My little boys are growing up! 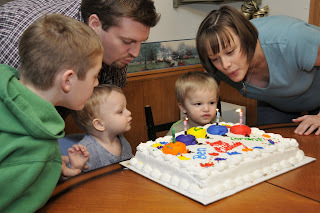 The cake was devoured (especially by Ben) and they were exhausted by bedtime. I hope they sleep in tomorrow. Holly and Amy were looking at some old pictures and found one of me. I don't know who said it, but it was said, "Look, this is actually a picture of Tiffani NOT pregnant!" HaHa. I'm sure laughing at that one. The funny thing was, I looked at the picture, and it was taken while I was pregnant, just not showing yet. At least I am not alone in feeling that I am always pregnant!